Now, normally I would write up this report and insert pictures in a chronolgical order but to be honest, I couldn’t say with 100% certainty, which fish came from which wreck and at which time. Plus too many pictues and not enough text make it all look a bit messy, so to keep things tidy and to stop me blathering about on about anything and everything, I’ll give a bit of an outline and put up some nice pictures. Photos are curtesy of the resident photographer for the day, Mr Terry Hill. 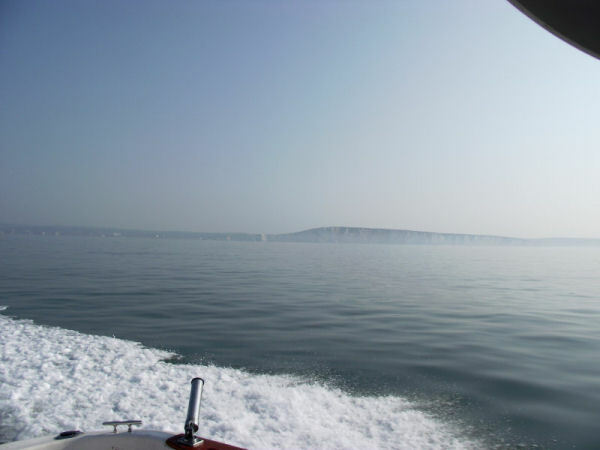 Following my trip out on Friday, I had the opportunity to again set out to sea on Sunday – this time, aboard a private boat, ‘Sea Mistress’ skippered out of Newhaven by WSF member Terry Hill. We met up at about 8am at Newhaven and after a bacon butty and coffee at The Captain’s Table, Terry arranged for his boat to be trailered from the boat yard, down the slipway and into the water. We set about stowing our gear aboard, while Terry fuelled her up and did other stuff. We were joined by fellow forum member, Dave and once everything was ship-shape, we set off out of the harbour. Terry opened up Sea Mistress once we were clear of the harbour confines and headed off to some wrecks in search of cod and pollack. Like Friday, the sea was mirror calm and with no hint of a breeze to ruffle the surface, we made good time. It wasn’t too long before we were over the first wreck and Terry set up the drift. 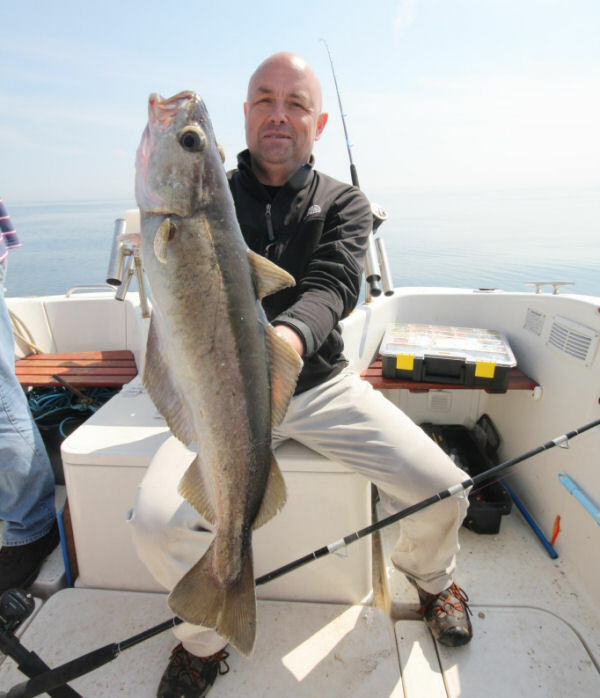 Tactics were the same – long flowing traces with artificial lures worked close to and over the wreck. Although the water was clear, it was evident that there was already a lot of the dreaded ‘May rot’ in the water which could have an effect on the fishing. 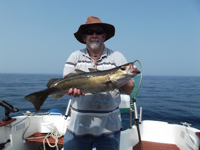 Terry was the first into a fish and nice bass was soon aboard. Expectations were high and we were buoyed up by such an early result. Unfortunately, that was the only fish on that wreck, so after a few fruitless drifts, we were off to the next mark, a few more miles out. Fishing was slow over the next couple of wrecks but Dave managed a couple of reasonable pollack, while I seemed to be attracting large pout for my efforts. Terry started up the engine again and we were off, this time to a wreck some sixteen miles out. Progress was good, with a steady cruising speed only interupted by the wakes of occasional passing larger vessels. First couple of drifts, I was getting small snatches at my lure but couldn’t get anything to take it fully. 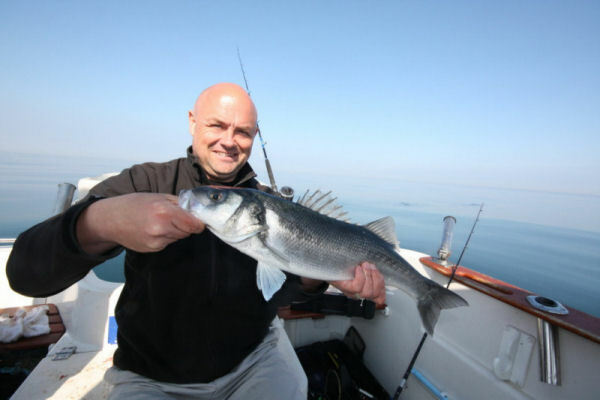 It wasn’t long though before I boated my first ‘proper’ fish, a small but welcome pollack. 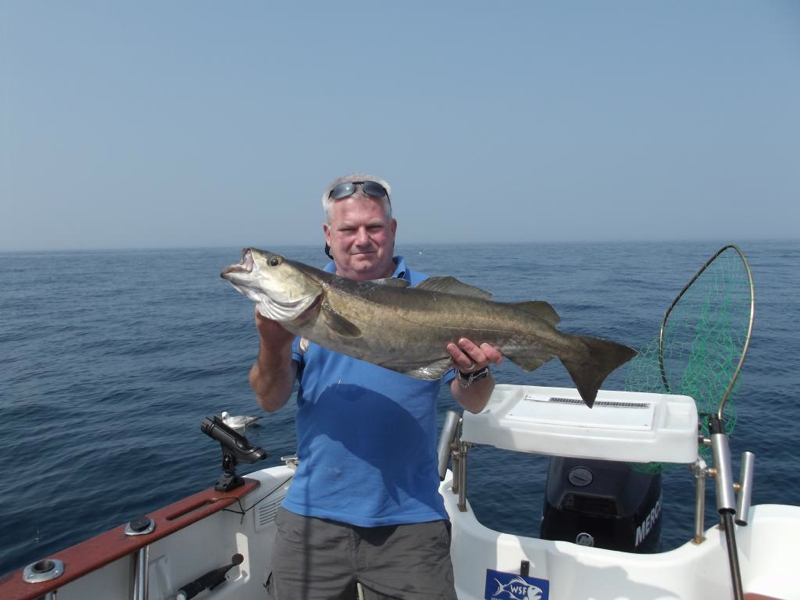 …and then not long afterwards, Terry got the first of the target fish of the day, a tidy codling. With renewed vigour, we continued to work the lures but to no effect, apart from more pollack for me and a beautiful little tub gurnard for Dave. 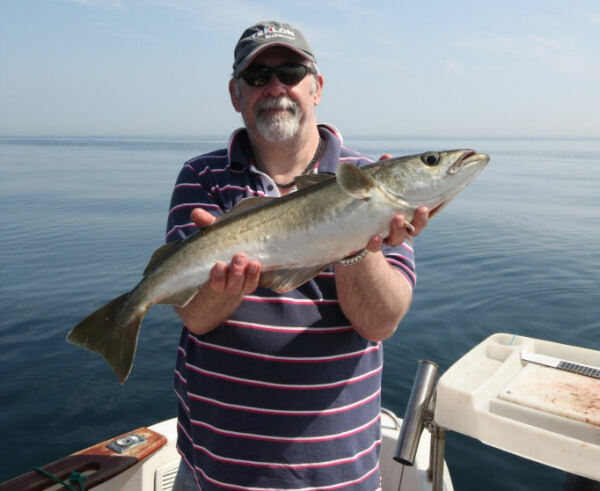 I then boated a whiting of all things – all this way out and I still get bloody whiting. At least it was of a decent size anyway. Another wreck later and although we still weren’t getting large numbers of fish, we sort of ticked over with bits and pieces. Dave then had his first bass of the session after a short tussle. …and he followed this up a bit later with the biggest pollack of the day at a shade under the ten pound mark. 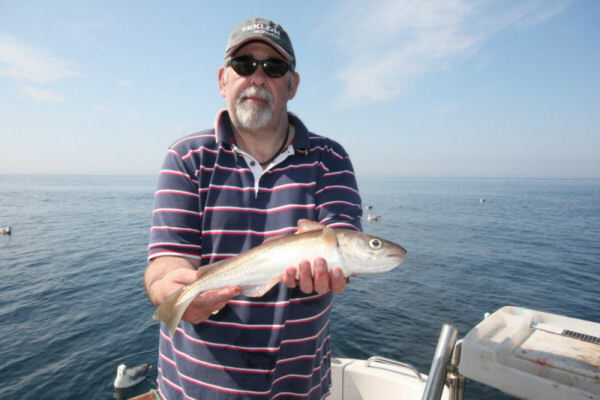 While he was doing the pollack – so to speak, I had my first codling of the day but unfortunately didn’t get a picture of it. We fished on for a bit and did some wrecks on our way back to port but as the tide slackened off, the fishing died with it. We decided on some ground fishing on the shoals off Beachy Head, so swapped our artificials for ragworm fished on long traces with plenty of beads and colour, in the hope of attracting a plaice or two. 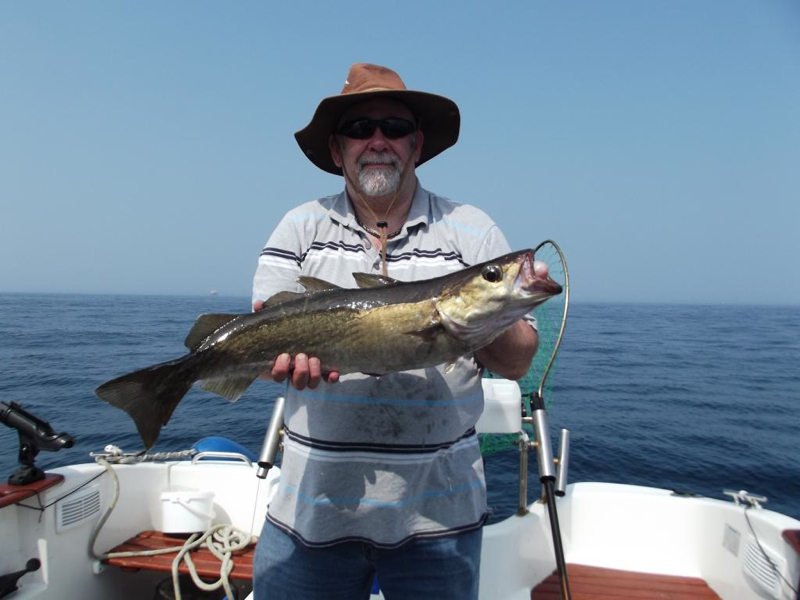 Alas, this wasn’t to be the case and all we managed to attract were pin whiting and pout. So it was with an Easterly breeze picking up and chopping the surface, we headed back to port. 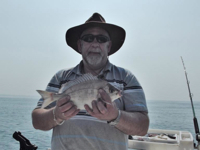 I attempted to fillet my catch on the return but this proved a little risky, so after one fish and deciding I’d like to go home with the same amount of fingers as I had when I left, I opted to fillet the rest at home. Back at port, we unpacked the boat and did other nautical things with ropes and pipes before collecting up our assorted bits and pieces and going our seperate ways. 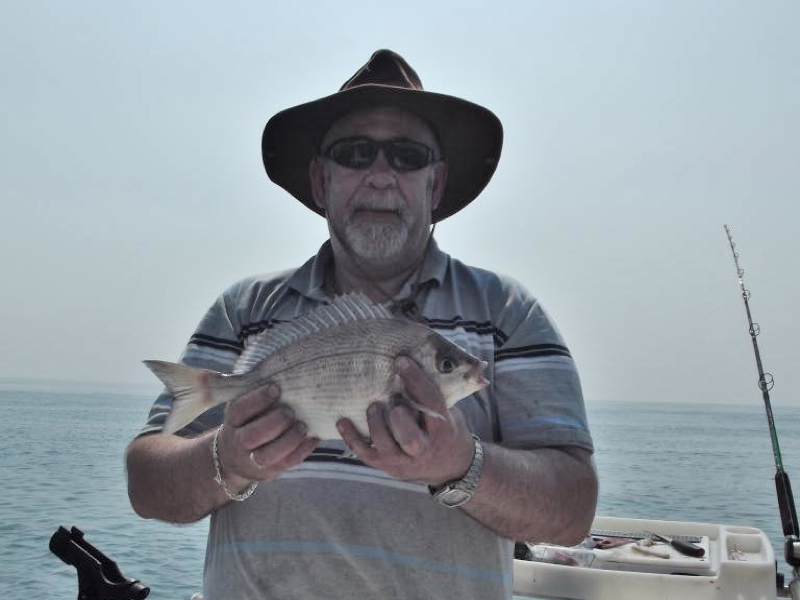 A big thanks again to Terry for the day out and putting us on the fish. Here’s the stuff I didn’t get around to preparing on the boat and is awaiting the filleting knife. Directions from the west (Red line on map): On entering Newhaven from the direction of Brighton and Peacehaven, follow the A259 round the one way system, past Denton Island, and over the swing bridge. Take the next left prior to the flyover, bear right and follow the road under the flyover then turn left at the end. Driver across the level crossing and take the immediate right into Railway Road. Stay on this road – it goes from Railway Road and becomes Clifton Road before becoming Beach Road. Park in the small layby on the right hand side of the road just before the water treatment works. Directions from the East (Purple line on map): On entering Newhaven from direction of Seaford, take the first exit off the large roundabout by Sainsbury’s and stay in the left hand lane. Take the second exit off the next roundabout by McDonald’s. Straight on at the mini roundabout and then left into Railway road. Once parked as above, on your right will see a break in the hedge, follow the path through and across the foot bridge over the rail tracks. Follow the path and over a small footbridge over the creek. 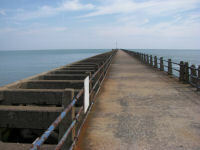 This path will carry on for quite a distance around the industrial estate and will come out onto the beach area. You will see the arm to your right, follow the path to access. Total walk distance = approx 0.6 mile from car park to start of arm. (Orange line on map). Although it can be a bit of a slog (especially if you insist on carrying too much gear), Newhaven East arm is a fantastic venue, offering easy fishing and a good variety of species. It’s also a reasonably sheltered spot in the prevailing South Westerly winds on account of the larger Western breakwater acting like a wind break, this makes it ideal when other venues are out due to wind. Being at the mouth of the river Ouse, it gives the option of fishing the inside into the river itself or the outside onto the sandy bottom of the Tidemills area of Seaford Bay. 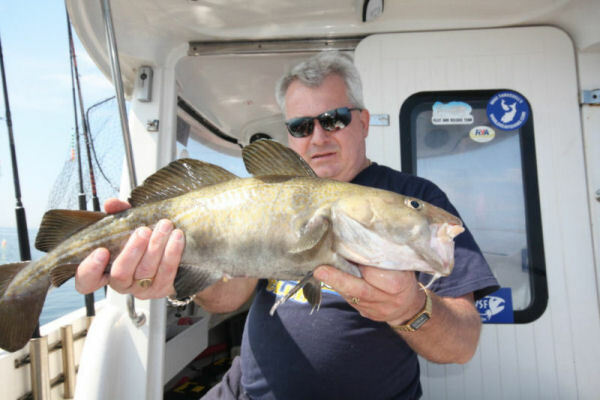 The inside during the Summer will see you catching eels, Pout, flounders, bass and Mullet while the winter will produce mainly whiting and flounders. 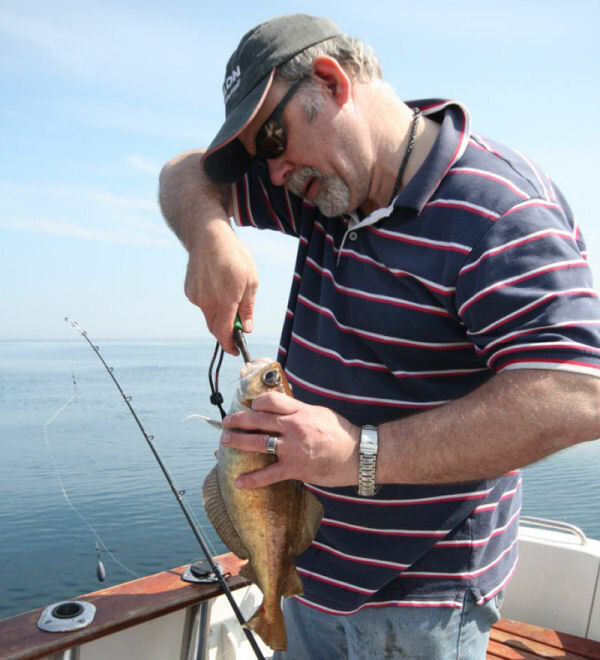 Recommended methods here include 2/3 hook flapper or running ledger baited with the the usual bottom baits of ragworm, lugworm and Crab. 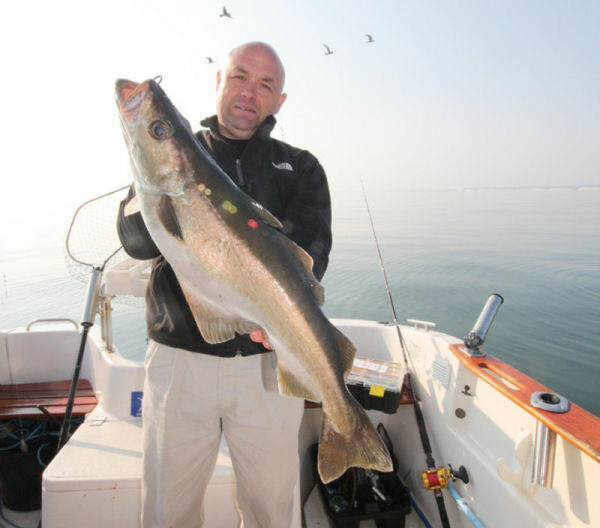 The tidal flow can be strong here, so be prepared to up the amount of lead used. Crabs will also be a problem, so expect to do frequent bait changes. Please be aware of craft using the river especially the bigger ferries! The better option at this venue is to fish into the bay either from the outside or off the end. A word of warning here – the outside of the arm is ‘hollow’ with only the concrete framework protruding out with no decking to speak of. This is separated from the main walkway by a metal railing. I would not advise climbing over and fishing the outside in wet weather as the possibility of slipping off and dropping into the oggin is quite high. 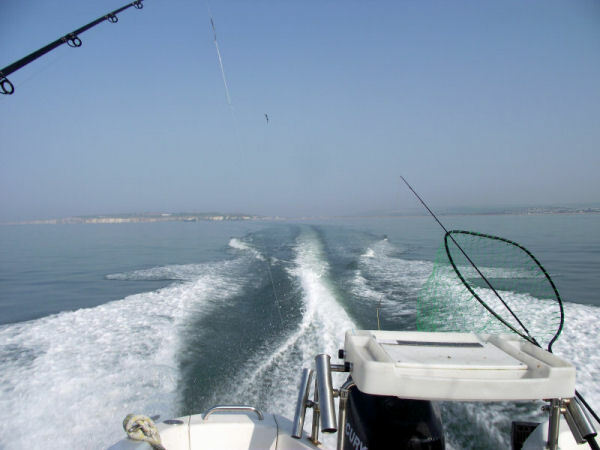 In the Summer, the species here include: bass, flounder, plaice, sole, pollack, Pout, mackerel, garfish, scad, Shad, Mullet (Greys and Golden Greys) and if you’re unlucky, the Weaver. 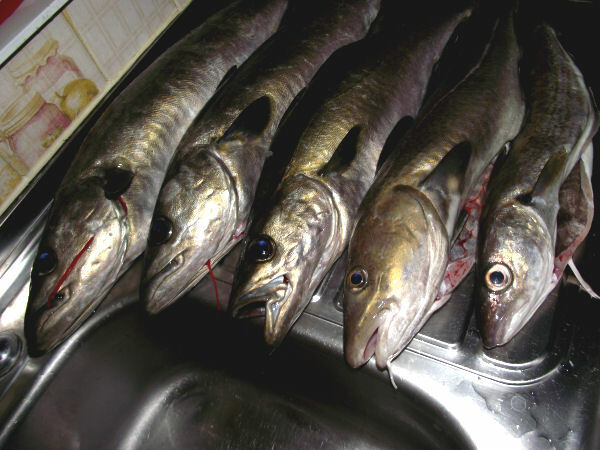 Float fished mackerel strip will take most of the free swimming species, while bottom fished worm will take the flatfish as well as bass and Mullet. 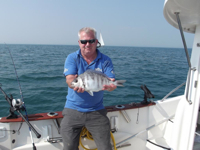 Bottom fishing methods include, flappers and ledgers either in single hook mode or multi, baited with lugworm or ragworm. 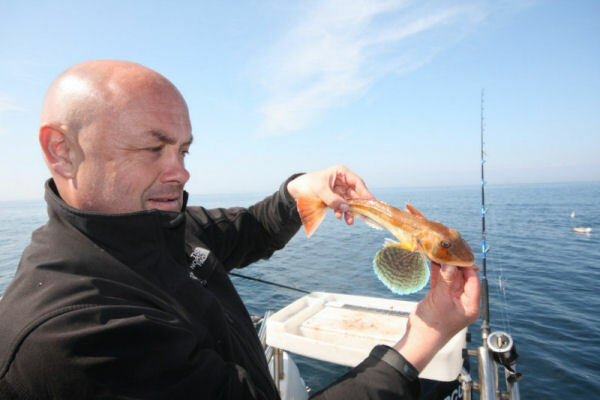 While these methods will catch you the round fish and the more predatory flatfish such as the plaice and flounder, if you are after sole, you need to have the bait firmly ‘pinned’ to the sea bed, so adapt your method and avoid long flowing traces that allow the bait to waft about in the current. Keep the traces short and consider using extra lead such as shot on the traces themselves or a specially made sole rig. A killer method for bass is to livebait a small Pout down the side of the structure but be prepared that any hooked bass is going to immediately seek to get in amongst the concrete pilings, so decent rod with some backbone, decent quality line and nerves of steel are required. 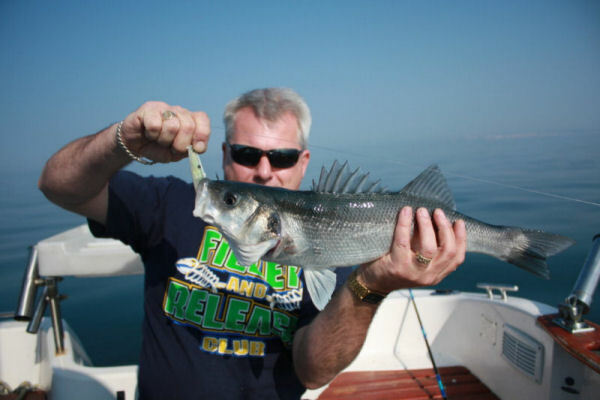 When after Mullet, they will also seek sanctuary of structure when hooked, so be ready and have plenty of plenty of swearing practice beforehand. Groundbaiting the area first is a good idea and bread or small small pieces of mackerel flesh are good baits for the Thick lipped Mullet. If you want the Golden Greys, then small bunches of Harbour ragworm (aka ‘Maddies’) fished on the bottom is a good method but fish the inshore end near the beach. 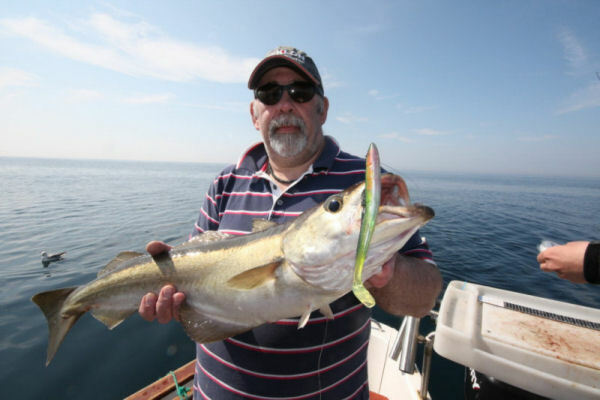 Winter time will produce whiting by the bucketfull as well as Pout and the annual plague of rockling early in the year. 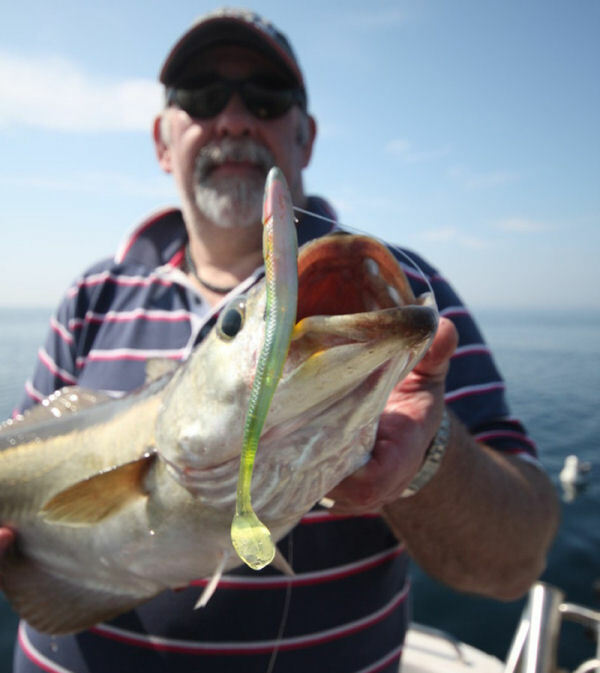 Again, bottom fished lugworm baits work best and tipping off with slivers of squid often entices the better fish.